Faces of Aleksanteri – Celebrating the 20 years of the Aleksanteri Institute | Aleksanteri Institute – Finnish Centre for Russian and Eastern European Studies was founded at the University of Helsinki in 1996. During its first twenty years, it has provided a working community for hundreds of experts in the field. Here you can meet some of them. Aleksanteri Institute – Finnish Centre for Russian and Eastern European Studies was founded at the University of Helsinki in 1996. During its first twenty years, it has provided a working community for hundreds of experts in the field. Here you can meet some of them. If ‘patriotism’ was the word that most people associated with Russia five years ago, it seems that not much has changed in that respect. 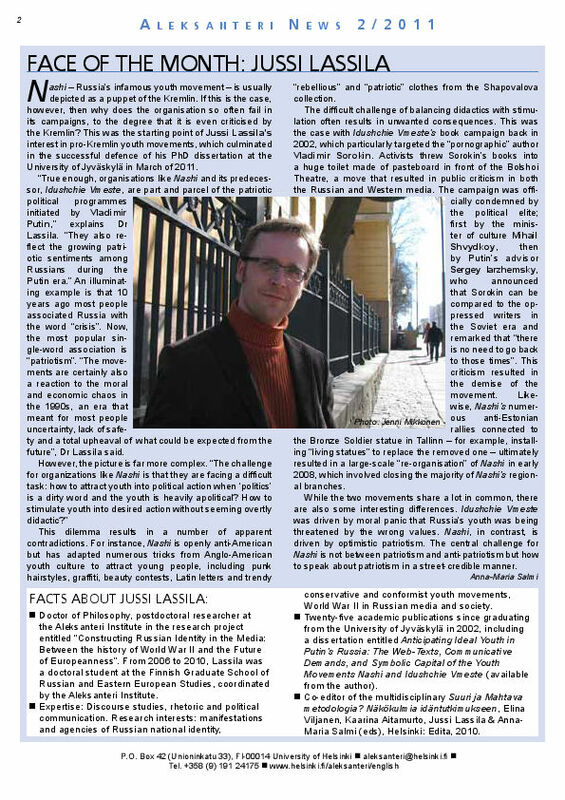 Jussi Lassila was interviewed in Aleksanteri News 2/2011 on pro-Kremlin youth movements. Nashi and its predecessor, Idushchie Vmeste, were part of Putin’s patriotic political programmes but also a reaction to the moral and economic chaos in the 1990s. How has the role of patriotism evolved in public discussion and atmosphere in Russia during these five years? One would guess that, for example, the ongoing economic crisis has strengthened patriotic feelings among Russians. Did the annexation of Crimea have the same influence – or on the contrary? This entry was posted in Yleinen on 22.8.2016 by Emilia Pyykönen. A few academics are as capable in juggling the diverse responsibilities of senior researcher, project manager and pedagogue as Sari Autio-Sarasmo. 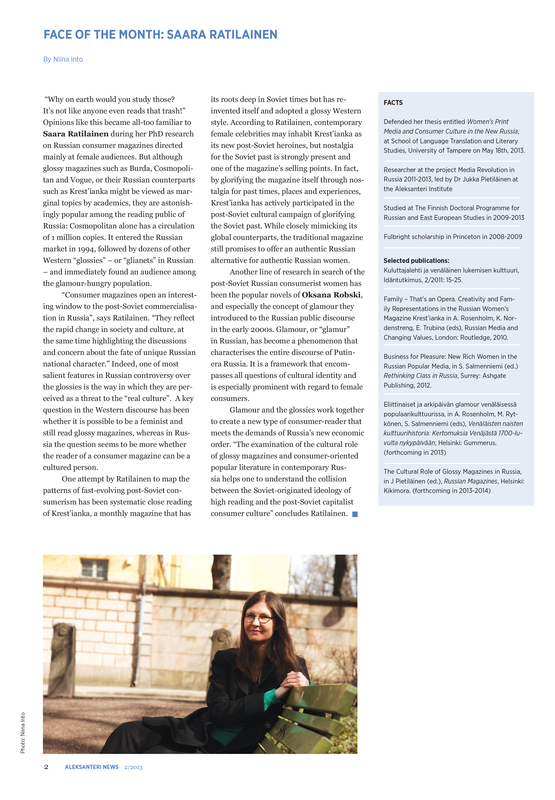 Sari has been involved in countless high profile international research endeavours – the latest being the Centre of Excellence in Russian Studies, Choices of Russian Modernisation (2012-2017) – in both scholarly and administrative roles but nonetheless kept a close contact with her students from undergraduate to PhD level. Her own on-going research is centered on innovations, diffusion of knowledge and digitalization in Russia in a global context. The KIC project ended in 2009 but spurted a lively continuation involving active networking with Nordic universities. Three PhD dissertations and several publications including an edited volume Reassessing Cold War Europe have been accomplished around the themes of Cold War studies thanks to Sari’s efforts. But what keeps her busy today? “I’m happy and excited about my new role as leader of a minor subject programme in Russian studies aimed at master level students from different faculties and disciplines. The new module focuses on the hot spots of Russian society: all courses are constantly updated in order to give the latest information. The modular structure is an efficient way of broadening the base of Russia experts in different fields of society and business.” In addition, Sari is involved in planning an international Master’s Programme in Russian Studies to be launched by the Faculty of Arts in autumn 2017. This entry was posted in Yleinen on 15.8.2016 by ninto. In 2016 Riikka Palonkorpi smoothly handles the task of coordinating three doctoral programmes under the Faculty of Social Sciences at the University of Helsinki, with more than 600 PhD students to look after. But seven years ago when she was interviewed for Aleksanteri News 1/2009 she was a PhD student herself. Riikka defended her dissertation entitled Science with a Human Face: the Activity of the Czechoslovak Scientists František Šorm and Otto Wichterle during the Cold War, in 2012 at the University of Tampere. Her work got a very positive reception in the Czech academic community. “My dissertation was recently translated into Czech and will be published in the Czech Republic by the publishing house Academia. After my defense, I also had the honor to be interviewed as an expert on Wichterle for material that is used in Czech schools”, rejoices Riikka. The interview was recorded in the middle of an exhibition built around Wichterle and the history of the soft contact lens in his native town Prostějov. There is subtle hope in this analogy: despite the difficult times, Czechoslovak science managed to thrive and develop. Let’s hope this rings true for Finnish scholarship as well! This entry was posted in Yleinen on 20.6.2016 by ninto. 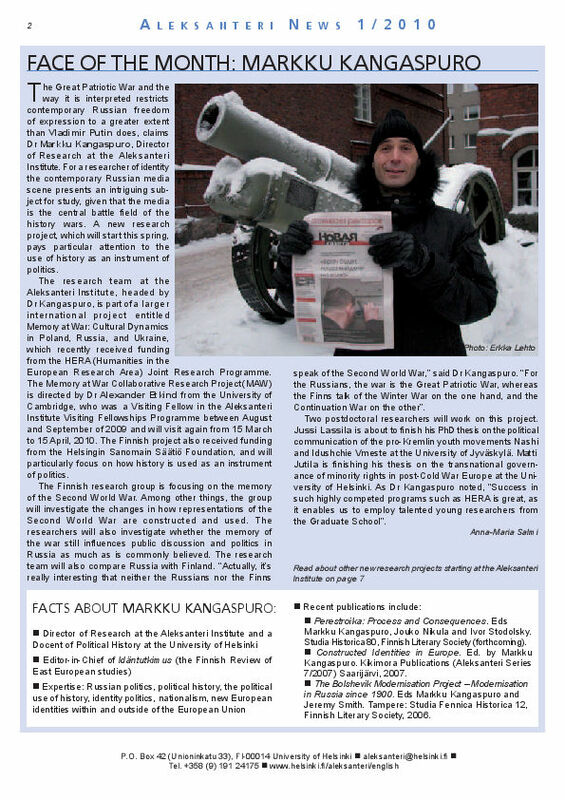 Markku Kangaspuro, Director of Research, was just starting to head a project within a larger international Memory at War collaborative research project when interviewed for Aleksanteri News 1/2010. The Finnish research group focusing on the memory of the Second World War kept busy not only Markku but employed also Jussi Lassila and Matti Jutila, both of them finishing their theses at the time. A lot has happened and much has changed during the 20 years of Aleksanteri. We asked Markku to analyse Institute’s strengths: what has kept it thriving throughout its history? How about your own research interests and projects: what keeps you most motivated in your work today? This entry was posted in Yleinen on 13.6.2016 by Emilia Pyykönen. 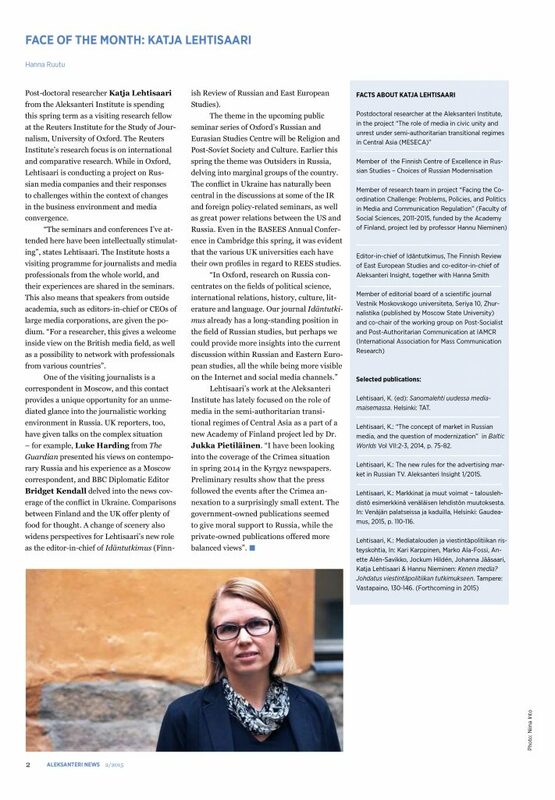 In an interview with Hanna Ruutu for Aleksanteri News 2/2015 Katja Lehtisaari spoke about ongoing research projects related not only to changes in Russian media business environment but also to the role of media in the semi-authoritarian transitional regimes of Central Asia. At that time, she was a visiting research fellow at the Reuters Institute for the Study of Journalism, University of Oxford. Now she’s back, so we asked her for an update. Katja is one of the members of the new Russian Media Lab team coordinated by the Aleksanteri Institute. In that context, her research has been increasingly focusing towards the questions of media regulation and formation of media policy. In media studies, comparative method is a fruitful way to understand global changes in news media. “I have lately also worked on another comparative project, on the business models of Nordic news media companies. This project has helped to contextualize many ongoing changes that are common to news media around the world mainly due to rapid development in digital technology and online environment”, concludes Katja. This entry was posted in Yleinen on 31.5.2016 by ninto. Study of politics in the time of major political changes is both a blessing and a curse, especially if one’s project is devoted to Russian politics. 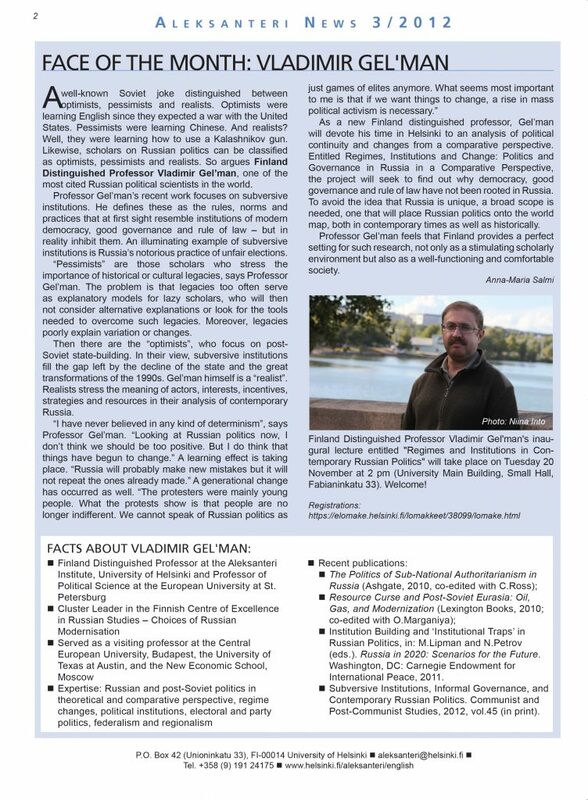 Vladimir Gel’man began Finland Distinguished Professorship at the Aleksanteri Institute in 2012, soon after the wave of anti-regime political protests, which swept Russia during the elections. After that, Russia’s annexation of Crimea, aggravating conflict with the West, and repressive turn in domestic politics, dramatically shifted the landscape of research on Russian politics. 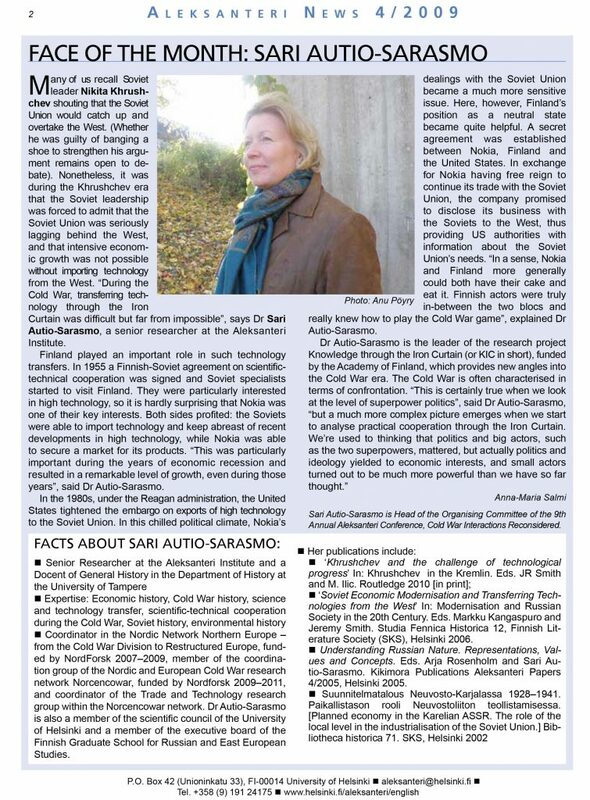 Below you can read the Face of the Month interview by Anna-Maria Salmi, published in Aleksanteri News 3/2012 (p.2) – a lot has certainly happened since then! That being said, he would not consider ongoing political processes in Russia as a complete deviation from its post-Soviet political trajectory. Recent changes are a rather logical extension of authoritarian tendencies in Russia since the Soviet collapse. Thus, a scholarly analysis of Russian politics and governance in comparative perspective is still relevant. To Vladimir Gel’man and his team, questions of the logic and mechanisms of the authoritarian governance in Russia and its effects on Russia’s politics, economy, and society appear crucial. “Comprehensive analysis of these issues require systematic collective research efforts. Our aim is to promote these issues on the research agenda and encourage further discussions among specialists in the field”. This entry was posted in Yleinen on 23.5.2016 by ninto. 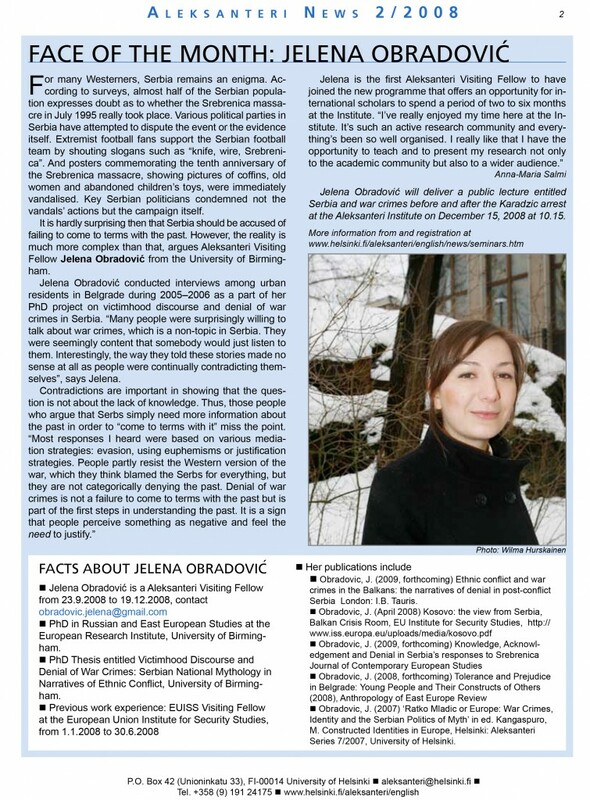 Jelena Obradovic-Wochnik, a recurrent visitor at the Aleksanteri Institute, was introduced as Face of the Month in Aleksanteri News 2/2008 as the first scholar to participate in the now well-established Aleksanteri Institute Visiting Scholars Programme. In 2008 she had just defended her PhD thesis on victimhood discourse and denial of war crimes in Serbia. Jelena has found her academic home at the Aston University, where she holds the positions of Lecturer in Politics and International Relations and Deputy Director of Aston Centre for Europe. Happily, she also maintains close ties with the Aleksanteri Institute. “Each time it has been absolutely fantastic to work here. The institute provides a rich intellectual environment, as there are people here working on cutting-edge projects”. Jelena can next be seen in Helsinki at the end of May, discussing new collaboration with Aleksanteri researchers on the idea of civil society in the Western Balkans. Go for a free ride in our time machine – read the Face of the Month story by Anna-Maria Salmi first published in Aleksanteri News 2/2008! This entry was posted in Yleinen on 16.5.2016 by ninto. Saara Ratilainen shared her thoughts as Face of the Month in Aleksanteri News 2/2013 just before her PhD defence on women’s print media and consumer culture in Russia. Read the interview written by Niina Into (on page 2). 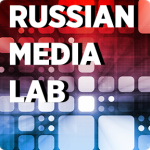 Today, Saara coordinates a budding new research project called Russian Media Lab at the Aleksanteri Institute. The project focuses on Russian media and freedom of expression and at the same time aims at deepening the Russian expertise of Finnish journalists. Russian Media Lab held an open seminar, Russian Media Today, as part of the UNESCO World Press Freedom Day festivities on May 2, 2016 in Helsinki. This entry was posted in Yleinen on 6.5.2016 by ninto. 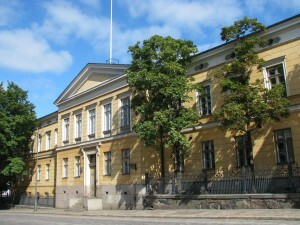 The Aleksanteri Institute is often identified by a photo of its beautiful facade on Unioninkatu 33. What makes the Institute so great are not the grand premises though, but the amazing people who work here. Since 2008, Aleksanteri News has been publishing a series of profiles called Face of the Month. To date, over 30 Aleksanterians have been interviewed in the series. As part of our 20thanniversary celebrations we decided to re-publish some of those stories. Take a free ride in our time machine during the following weeks to see what Russia and Eastern Europe looked like to our researchers in 2008, 2009, 2010… and how those same people see it today. A lot has changed as you will see, but most questions that we’ve brought onto the agenda over the years still seem relevant now – maybe even more so. Did we manage to predict any of the developments? Would it have been possible? Where should Russian and Eastern European Studies be looking now? This entry was posted in Yleinen on 26.4.2016 by ninto. What is the situation in Georgia now? “Relations with Russia have improved since the Georgian Dream coalition rose to power: the Georgia-Russia border is now open and trade embargo has been lifted. On the other hand, Russia has implemented “borderization policy” in South Ossetia and Abkhazia by unilaterally re-labelling the administrative borderlines between Georgia and two of its breakaway regions as state borders In fact, Russia has been slowly expanding these “borders” for its own advantage and thereby occupying more Georgian territory in a process of creeping annexation. Russia has also signed treaties with separatist entities in both South Ossetia and Abkhazia, thus making prospects for Georgia regaining its control over these two territories in a near future seem unlikely. Georgia’s Euro-Atlantic integration has made steady process in eight years, milestones being an Association Agreement with the EU and European Commission’s proposal of visa-free travel to the Schengen area for Georgian citizens, which could be achieved already later on this year. 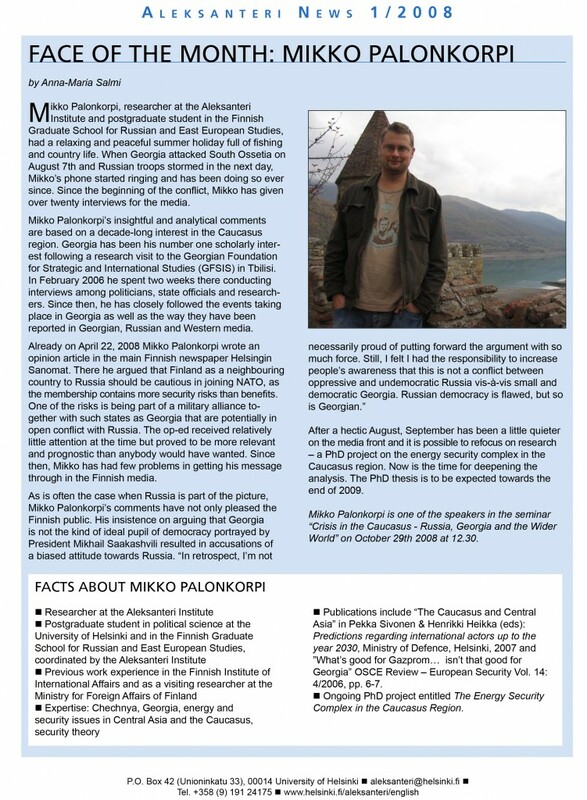 NATO membership for Georgia however, is not much closer now than it was in 2008,” says Palonkorpi. Renewed heavy fighting in Nagorno-Karabakh, Iranian nuclear deal and deteriorating Turkish-Russian relations over Syria have all affected Georgia. On a more positive note, tourism industry in Georgia has witnessed a spectacular growth in recent years. 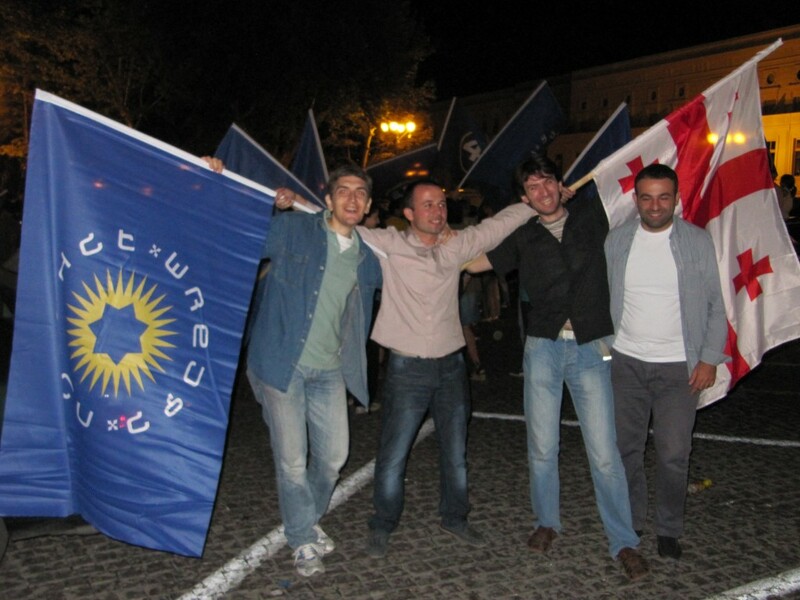 Supporters of the Georgian Dream – Democratic Georgia celebrate the election victory of the coalition in Tbilisi in 2012. Photo by Mikko Palonkorpi. Mikko Palonkorpi is currently running his own company Mikko Palonkorpi Photography that offers consulting and photography services (contact: mikko.palonkorpi@gmail.com). This entry was posted in Yleinen on 13.4.2016 by ninto.